This is a huge day for Layers of Love. To be honest, one I knew would come, but just not as quickly as it did. I mean I set the goal of 74 blankets by Sept. 2, because that is my dad’s birthday. Honestly, I really didn’t think we would hit that goal date. I knew we’d hit the goal, I just wasn’t sure when it would be. However, a young man had a different idea. I would like to introduce you to Sam Keefer. Sam contacted me a few months back about the possibility of doing his Eagle Scout project to benefit Layers of Love. His mom saw an article on Layers of Love in the Cooper Hospital newsletter and thought it would be a great project for Sam to take on. And take it on he did. And in a BIG way. The 17-year-old held a fundraiser at the local bowling alley, accepted monetary donations and blanket kits from family, friends, the instructors and students of the National Karate Institute and Greater Harmony Yoga, our Church Community at Holy Eucharist in Tabernacle and the Mt. 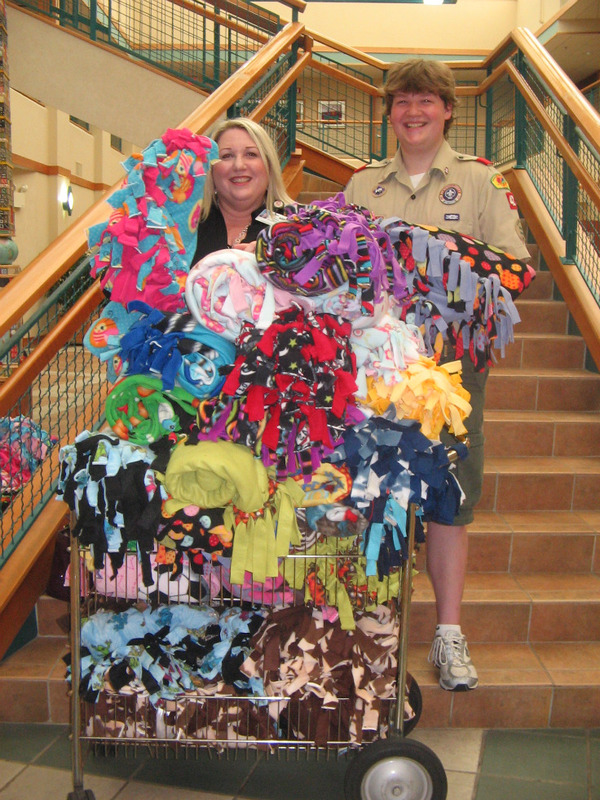 Laurel scouting community, raising enough money to buy more than 50 fleece blanket kits… 54 to be exact. 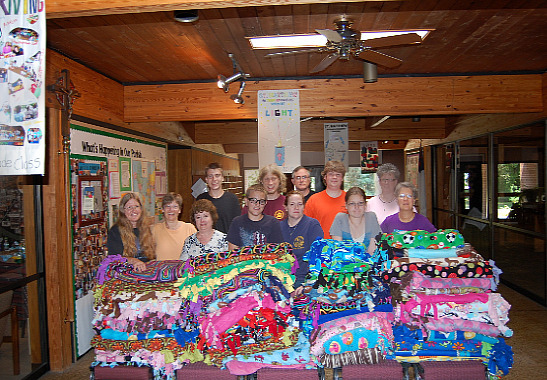 Sam then organized a blanket tying event at a local church. He invited everyone to come help cut the blankets and then tie them all together. So on Saturday from 9 a.m.-noon, many people gathered to help him complete his project. It was a fantastic event. He also served bottled water, coffee, donuts and fruit for everyone who volunteered. Sam had two cutting rooms set up where volunteers prepared all the blankets to be tied. After the blankets were cut, they were then moved into another room where volunteers waited to tie the blankets. Once the blankets were tied they were folded and placed into bags for transportation to Cooper Cancer Institute in Voorhees, New Jersey. Sam organized the project from start to finish. It required a lot of time, effort and hard work. It was by all accounts a huge success. Yesterday Sam delivered the blankets to Cooper Cancer Institute. 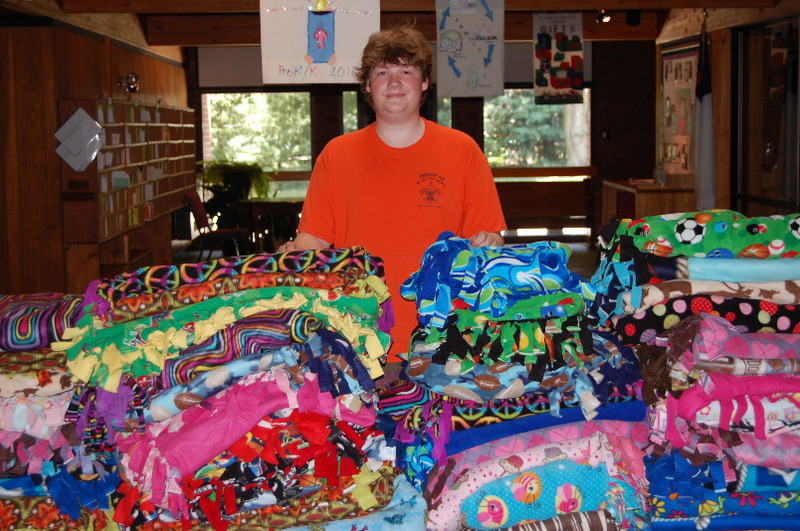 The employees at Cooper were overwhelmed at how many blankets Sam was delivering. They were completely blown away over his Eagle Scout project. Pictured below is Sam with the blankets and Bonnie Mehr, Manager of the Dr. Diane Barton Complementary Medicine Program Cooper Cancer Institute – Cooper University Hospital. Wow! 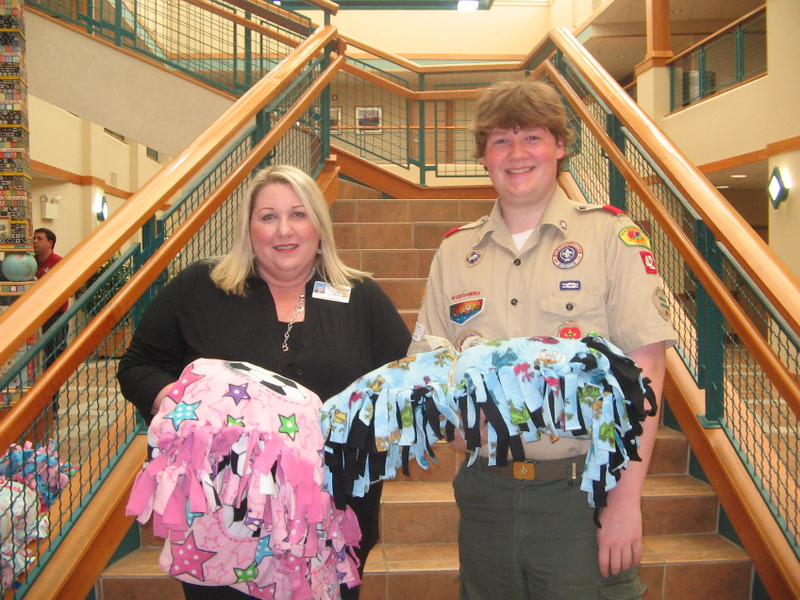 Sam’s Eagle Scout project produced 54 blankets for delivery!! I had the pleasure of meeting Sam and his family at the blanket event he held on Saturday morning. They are a wonderful family. Sam is an amazing young man who will begin his senior year of high school in the fall. He said he was looking into political science or history as his major in when he moves on to college, but hasn’t made a final decision. I don’t think it matters what path Sam chooses to do in his future, because I know he will be a success no matter what. I cannot thank Sam and his family enough. What they have given to me and Layers of Love is an amazing gift. Not only the blankets, but just crossing paths with him and his family has made such a big impact on me. I am so happy for the all the chemotherapy patients who will now have comfort and warmth as they go through their treatments. If you haven’t donated and would like to do so there is still time. Even though our blanket drive hit our goal, the donation drive still continues as we are scheduling one more trip to Cooper Cancer Institute before September to deliver the last of the blankets that we have waiting here. You can send your blanket donation to: Layers of Love 665 Pine St. Palmerton Pa 18071 THANK YOU! This entry was posted in Donations and tagged blanket tying, cancer, chemotherapy, Cooper Cancer Insititue, Donations, Eagle Scout, event, fleece, fleece blankets, Project, thankful, thanks. Bookmark the permalink. Way to go! I can’t believe you already managed to hit your goal… what a great story. Dear Sam, I can’t thank you enough for the love and generosity you have shown me. Monday I started my first session of chemotherapy, and was very nervous and scared! I looked at the entrance and saw this beautiful young man in a uniform. I also saw a multitide of colors piled high on a cart. They were warm comforting blankets and I had my choice of which will help me through this trying time. I want to thank you for all your caring. My friend sent me this article, and when I started reading, I cried. It was a good cry because I know there are people like you and life is good!